A Bigger Bounce is a bi-annual event organised by Breast Cancer now. In its inaugural year in 2013 £850,000 was raised with £1million being raised in 2015. With the event being held in one our moving hotspots in Camden, London, we are always there to lend a hand. Breast cancer is one of the most common cancers in the UK, however, survival is continuing to improve with 99% of those diagnosed with stage one surviving more than 5 years and around 65% surviving more that 20 years after diagnosis. It is partly through the work of charities like Breast Cancer Now that have assisted with such improvements in breast cancer treatments, with the overall aim of making breast cancer history by 2050. A Bigger Bounce is a glamorous gala dinner and charity auction, with all the proceeds going to Breast Cancer Now. 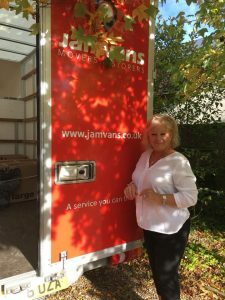 With the glittering backdrop of the Roundhouse, Camden, in the centre of London, the tables need to be set up in a similar fashion, and that’s where JamVans come to help. Starting in the morning, we collect the floral displays which go on each table at the event, it is of paramount importance that the flowers are secured into our removal vehicle in order to stop them from moving around. With the event the same day, there is no room for second chances. 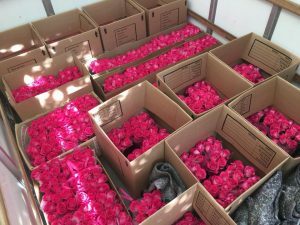 Once loaded, the van heads to Camden where the flowers are carefully handled by the team of porters there to help and are placed into their position on the tables. Our driver is then on hand for any other assistance required. There is great gratification in being able to help such an event for a cause that means so much to so many. Helping deliver the flowers is just a small part of the event that is put together by so many volunteers. We wish all the best to the event this year and hope that the £1million raised in 2015 is beaten this year!